1.In a large skillet, cook the beef, onion, garlic and zucchini over medium-high heat (350 degrees in an electric skillet) until meat is browned and broken into pieces. Drain any fat. 2.Add the pasta sauce, basil, oregano and red pepper flakes, if desired. Bring to a simmer and cook on medium low (275 degrees in an electric skillet) for 15 minutes. 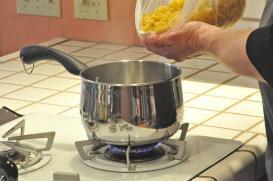 3.Cook the pasta in boiling water according to package directions. 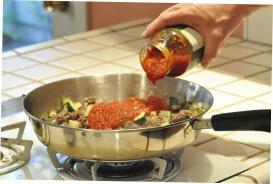 5.Add pasta to the sauce in the skillet. 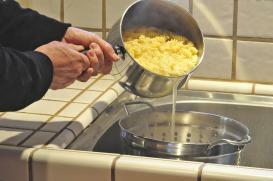 Stir in the cheese and cover until the cheese is melted. 6.Refrigerate leftovers within 2 hours. 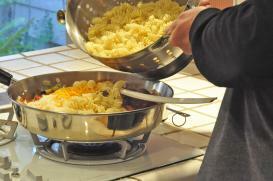 1 Comments for "Cheesy Beef Pasta (Picture Recipe)"
Wow this is so simple! I shared this recipe with my children and they were able to make it for me!